3.5km of fine sand between the corniche (cliffs between Ciboure to hendaye) and the Bidassoa at the spanish border. It is also one of the safest, ideal for children and novice surfers. The sea-front has lots of shops, bars and restaurants. 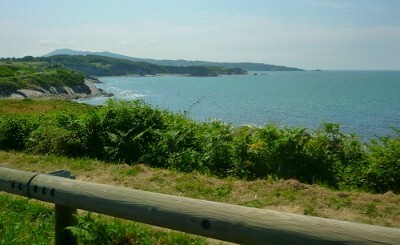 via the coastal path, the "Sentier du Littoral"
The view of the Basque Coast, Ocean and Mountains, is fantastic !